Club Penguin Cheats by Mimo777 Club Penguin Cheats by Mimo777: New Club Penguin Log In Screen! Club Penguin has updated the Start Up Screen. Or, I guess we should call it the Log In Screen now! It hasn't changed yet for me. :) I like the old one better though from what I can see in your screen shot. There's nothing wrong with the old one, so why are they changing it? that is so cool! do you think more stamps will come soon? It is not like that for me. Also, i have a question for you that CP isn't responding to my email. My name is linky if you could answer my question. Cp is always freezing when i get to the log in page. When i do get in, it freezes within 10 seconds. That "New Stamps Are Everywhere" picture is a little weird. 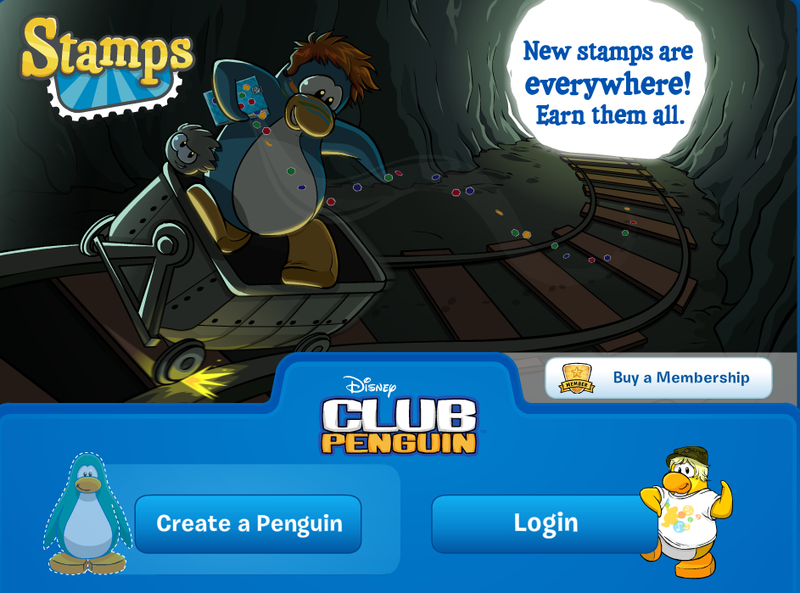 That penguin is losing a lot of stamps when he is skating down the mine track. Does anybody else know this? Hey mimo! Did you notice CP also updated puffles when you walk with them? They were updated even in player cards! mine is the old one it dndt change why!?!? When you walk your puffle it has changed like when its in your iggy its animated face! Has it ever occurred to you that the stamps could have been going inside? oh, and i also agree with linky and kattelyn, my start screen isn't different.. maybe its only for the u.s. or somthing? they're different rihgt, well have u seen them on the PLAYER CARD! ADORABLE!! That log in screem has been there before like 3 months ago! And so was the system defender start screen one. They were testing the login screen just like the other one in 2009, they had it for about a week until they changed it to the current one. I can't log into Club Penguin on the English servers. It's just a blue screen. I've cleared my cache and my cookies, but nothing! I have to log into a Spanish server just to get on. Hey Mimo, i couldnt find out how to contact you, so i thought id do it on here. Have you noticed the one man band glitch? it seems that when you dance it just dances normally, instead of playing the instruments, do you think its a bug? CP wasn't working so I cleared my cahce and it started working again but I have the old Log In screen again when I actually had the new one before. Has it changed back to the old one for anyone else? i like it but remember like 2 months ago they said there would be hats for puffles where are they? Well I live in the U.S and my log in screen isn't like Mimo777's. But still I think it's neater than the old one. Hey Mimo there is a bug at the forest where you can hear the boiler room music. I think more stamps will come soon, because from the looks of it, they still have one game console left over in the lounge! Plus, The Music Jam is coming up soon, so DJ Cadence and The Penguin Band should be walking around! Hey! Have you noticed that the puffles look different when you walk them? Take a look! To Teegan x.X.x , I had the same problem with the start page. But dont worry! You will get it soon!